I'm so excited to share with you this year's gift guide for little guys - aka. Jacob's wishlist. We're really trying to cut back on toys this year and zone in on things that he loves and will help him with his preschool development. His big Santa gift this year is his RC monster truck which you can read more about HERE. ONE. (For the kid with a sense of humor) Jacob comes home from preschool almost every day with a joke that he thinks is hilarious. This book is full of fun new jokes to add to his repertoire. TWO. (For the kid who likes to pretend) These dragon wings are so fun with that spiky tail, but we also love this lumberjack set, superhero set, and fireman gear. THREE. (For the kid who needs some fine motor help) I remember playing with Lite-Brite as a little girl and I know Jacob will like it too. It's awesome muscle work for little hands picking up those little pegs and placing them in the holes to make pictures. FOUR. (For the kid who loves art) I love this classic wood easel mostly because it comes with a paper roll attached so I don't have to spend all day cleaning off dry erase marker. Replacement rolls are also available. FIVE. (For the kid who wants to be a fireman) This two story house comes with firemen, a fire truck, helicopter, and accessories. Think dollhouse for boys. SEVEN. (For the kid who's afraid of the dark) Those toddler/preschool years seem to come with their own set of challenges and fears. Jacob's recently found himself afraid of the dark, so we picked up this little owl that lets off a soft glow, projects stars, and even plays music or nature sounds. EIGHT. (For the kid on the move) We reviewed the Huffy RC Monster Truck HERE and then promptly put it away as Jacob's big "Santa" gift. It can be used as a remote controlled car or kids can ride on it. Two toys in one!! If you haven't figured it out yet - Jacob is all of these kids. He would be thrilled with these gifts and I know your little guys would be too! 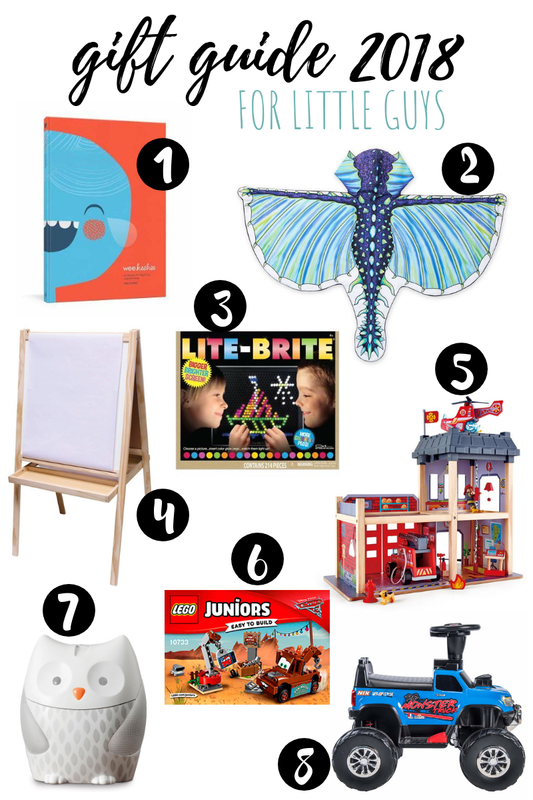 What do your little ones want for Christmas? 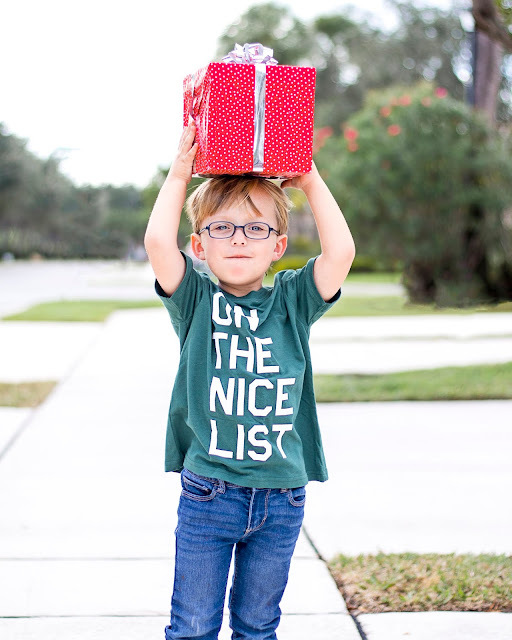 3 comments on "Gift Guide for Little Guys "
I love his shirt! Lol! And the kids love Legos! LEGO junior sets are the best! And I never even thought to get my kids a light brite...great idea. I just saw Lite-Brite in the store today and almost bought it for myself!! These are all great suggestions!